A Mexican federal security official said drug cartels forced gang members to eat the hearts of murder victims as part of an initiation rite. The hidden purpose behind the alleged cannibalism was to root out infiltrators. Details about the cannibalism came to light during a local Mexican television interview with Alfredo Castillo, the federal security commissioner in Michoacan, Western Mexico. He said the practice wasn’t widespread, but that various eyewitness accounts indicate that heart-eating was part of an initiation used by La Familia Michoacana and the Knights Templar. "The ritual ranged from dismembering people they intended to kill to sometimes serving up the heart," Castillo said, according to Reuters. Both gangs were founded by crime boss Nazario Moreno, or “The Craziest One,” who was killed in March 2014 – well after the previous government declared him dead in 2010. Castillo didn’t say who provided the testimony or when or where the rituals took place; he simply said the gangs used the practice to root out infiltrators. 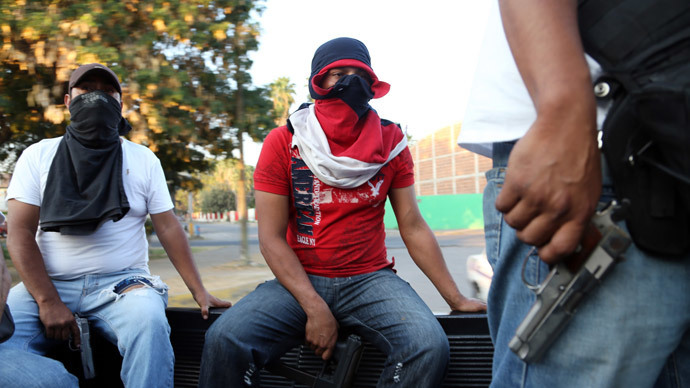 Over the past year, the agricultural state of Michoacan has been the center of an intense struggle between vigilantes and drug cartels which have splintered into violent factions. A mid-December shootout between two rival gangs killed 11 people. The continued fighting in Michoacan, combined with the Mexican government’s mishandling of the investigation into 43 missing trainee students from Guerrero – supposedly murdered by a drug gang working with corrupt police – led to months of protests in Mexico and around the world. The protests were directed against the government and led to President Enrique Pena Nieto announcing a 10-point security plan in late November. That plan included a sweeping overhaul of local police forces, constitutional amendments, and the creation of special economic zones in the poorest parts of the country. Specifically, his plan called for making constitutional changes that grant state control over police, in effect scrapping nearly 2,000 police agencies and reducing them to 32 single agencies per state. The government will also send federal police to the worst affected areas – the Tierra Caliente region, Guerrero, Michoacan, Jalisco, and Tamaulipas. Pena Nieto also proposed to set up a nationwide emergency telephone system, like America’s 911, as currently there are many different local emergency numbers.